My first attempt to bust the daily commute is by cheating, just a little. 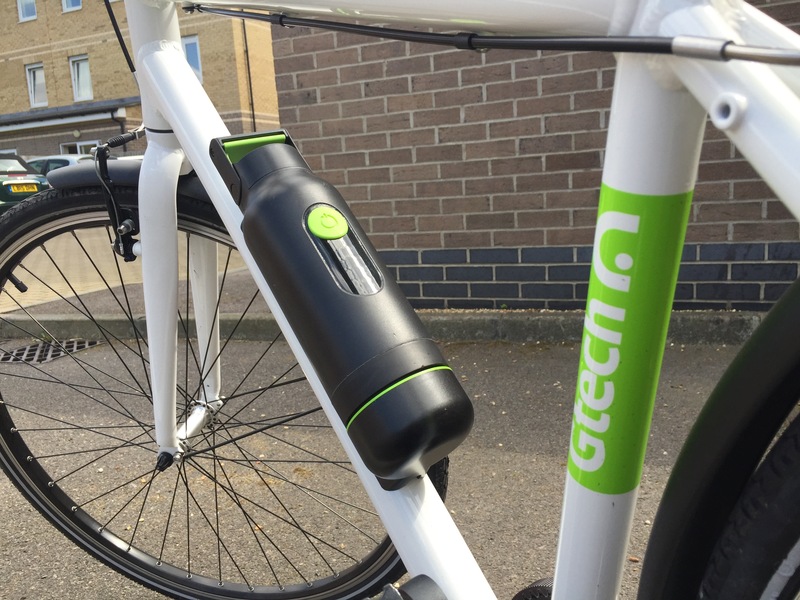 The chaps at G-Tech sent over their sports electric bike. They’ve got two options of electric bike, Sports and City. I still want to get to work with some sort of street (cycling) credibility in tact and for a gentleman, the city version is a little too classic lady. It’s not a sports model in the car sense, where everything is stripped back, any excess weight is sliced away and often compromising on comfort. This bike has some cool tech added, it’s heavy (16kg) and has some great finishing touches to help you arrive in relatively less discomfort. How does the bike look? Let’s all think of an electric bike, what do you think? Answers in the comments, please. Do you think if you saw it at the lights you would know it’s electric? When I think of one, I think of a big bulky heavy metallic purple thing. I used to this exact bike going the opposite way to me on my way to work, every morning through the park. Their legs moving very slowly but the bike flying along and a very smug looking older lady sitting on it as she scooted along past other cyclists. Let’s have a look at the G-Tech Sports Bike though, and I’m sure you’ll agree it’s very, well, average looking. Looks distinctly like a bike, doesn’t it? I quite like it but I do find its bright white colour a bit stand out. Thick round tubes and big tyres with wider handle bars than I’m used to. Be under no illusion, it’s no sports bike, much more of a tourer. The battery is a black water bottle look-a-like. It is very descrete for an electric bike battery. Gone are the old days of a really bulky battery somewhere between your legs making you cycle like John Wayne. This is quite a powerful little thing. Sitting on the down tube right where the water bottle holder usually is is a large, black, water bottle sized battery. This is a lithium-ion battery that will give you enough charge for 30 miles of riding. Ideal for me as I’ve only a short commute and don’t ride this bike everyday, so a full three hour (quick) charge, once a week is handy. Usually plugging in at work and forgetting about it until home time, even though it only costs 4p to charge it fully, apparently. The battery has a few cool features too, it comes off for one. Really easily too. 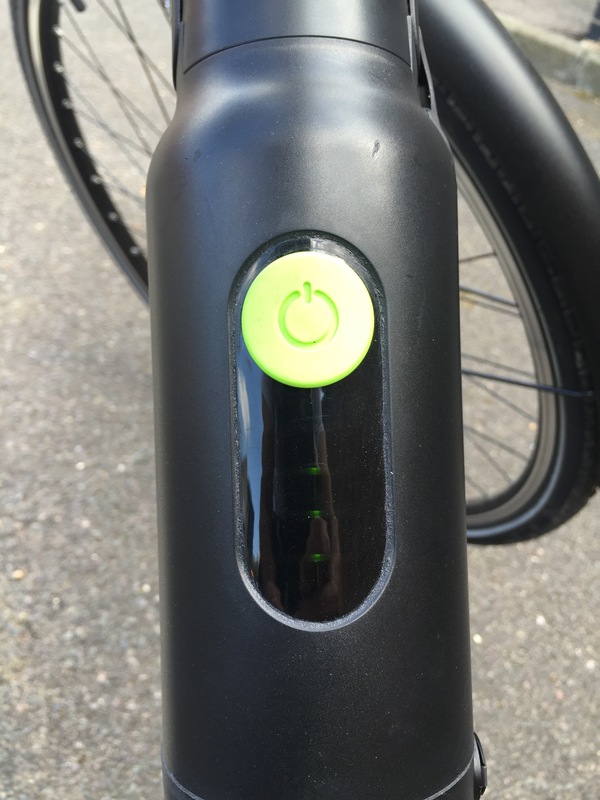 You just pull the little green tab up and move the top towards the seat tube and, click, off comes the battery. Meaning once you’ve parked up on the street, at work, at home or you need to charge it, you can unclick the battery and walk off with it, saves someone else walking off with it! Easy to remove. Easy to replace. 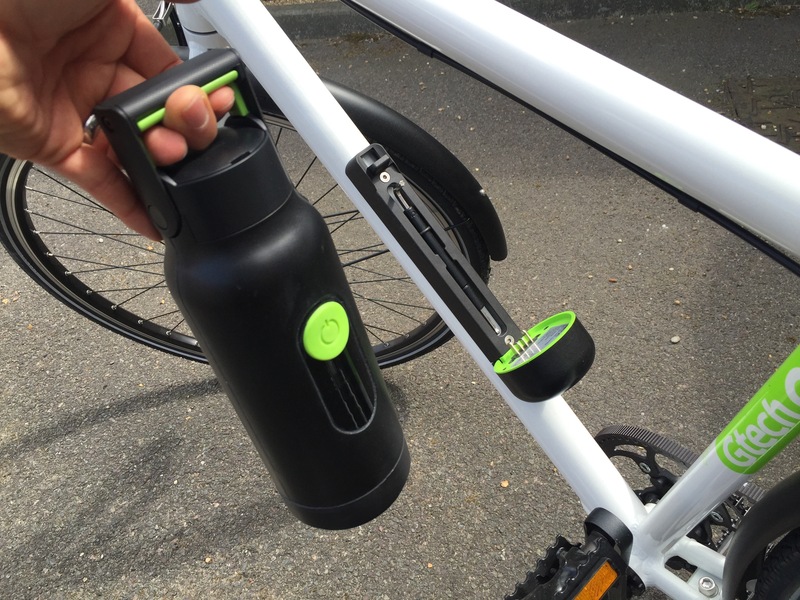 You can even lock it in place with a key, so when you’re riding no one just pulls it out, or it doesn’t pop out over bumpy terrain, or just the pot holes streets. Handy. Turning it on and back off again is even simple, you push down the big green button until you see the lights on the battery come on. Lights indicate charge, so if all four of your lights are on, 100% charge. The motor on this bike sits in the rear wheel. It really has been designed with maximum thought in to the minimum amount on show. 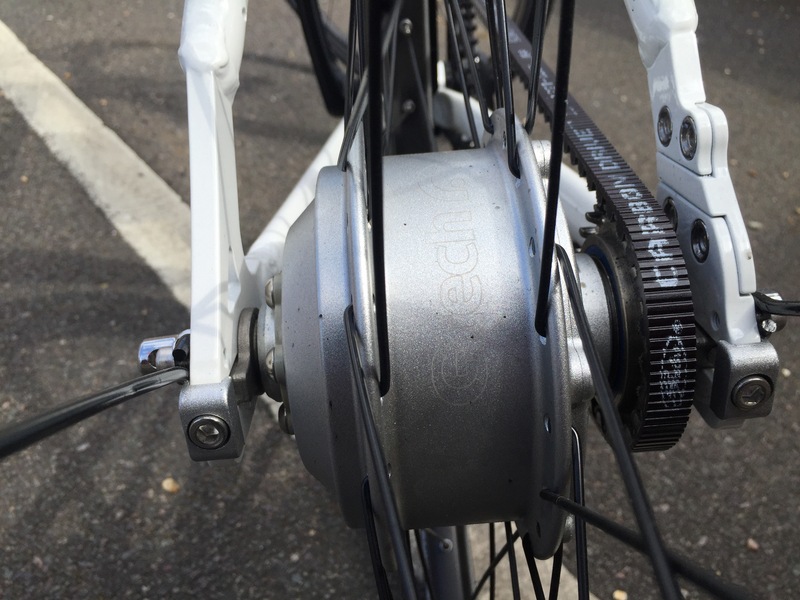 You really wouldn’t think that in that rear hub is a high torque motor, capable of propelling you up to 15 miles per hour! Yeah, 15mph! The first initial hit of power from the motor is really powerful, it propels you up to speed no issue what so ever, it’s quite a kick, meaning you’ll beat pretty much anything or anyone off the lights. But what’s it like to ride? The electrical boost takes a bit of getting used to, if anyone is in front of you when you’re looking to go, with the motor kicking in you have to judge things well, or pedal bit by bit. After that it’s just like riding a bike. The wheels are large, the frame is bulky, the full aluminium frame offers nothing in the way of suspension so you feel the bumps. The bike handles well enough, it feels a bit slow through the corners, fairly well balanced but remember this – it’s s commuter for sure. Don’t get hung up on the sports handle its given. While it’s fast, it’s not made to go racing against the lycra on carbon fibre. Braking is adequate, it’ll slow you down but with a 16kg bike going at 15 miles an hour, they’re a little spongy for my liking and I tightened them up straight away. For out the box brakes though, they’re good enough and will see you home. If I were to keep it though, I’d upgrade them to something a little sharper, mainly for the reason I’m cycling around central London and like to be able to stop instantly when needed. I’m torn you know. I think the boost is fantastic and when I’m floating up the hills and shooting away from the lights I think it’s great. When I’m half way up the climb I feel like a mechanical doper. I have to tell myself that I’m riding this bike to help myself arrive fresh to and from work. It’s not a bike for fitness training, it’s a bike to get to and from on, nothing more. 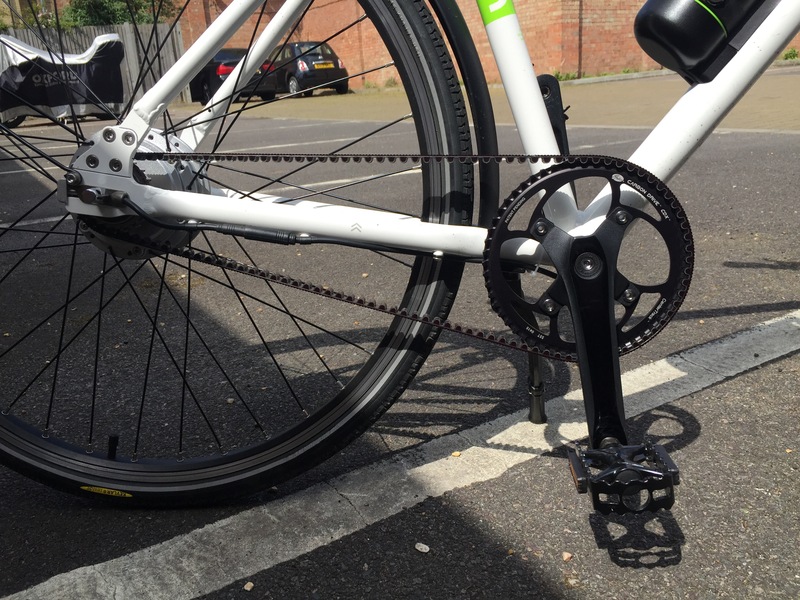 The carbon drive belt is quiet and no chain oil on your calf! Win! That’s where it loses a bit of its soul, it feels like I’m riding a robot… That I’ve had to charge up, a dirty little secret that only I know, I’m on an e-bike. That’s why I arrive in comfort and not breathless. Then I look at it and think, ‘you’re fantastic!’ It would be the perfect bike for an elderly person to scoot about on. With such little fuss, still getting the fitness in, you can do a 30 mile ride getting the heart rate up and have a helping hand home too. I’d heavily consider buying one… But I think the £995 is a little too rich for my blood. I’d rather spend the money on a Boardman or something like that where I could get out on a good long ride on. However it doesn’t mean that I wouldn’t recommend it if asked by someone in the market for an e-bike. 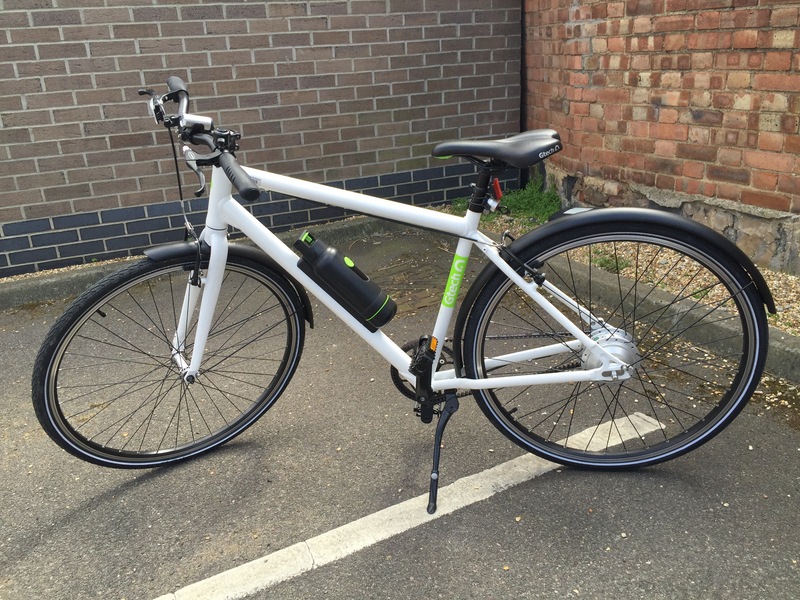 Can you buy this bike on cycle to work scheme as gtech emailed me this month and said not ? I’m not sure – I’d go with what they say. The title is a play on the scheme as its a series of blog posts dedicated to cycling to work in comfort and style. Cheers. Not the answer is wanted as would have liked one!